We paddle to the beautiful St John’s island with old growth trees and an even older history. Once this island was the largest quarantine center in the world. And what did "Sakijang" and "Bendara" had to do with this island? Besides paddling, we will take you on a short hike among the parkland of St John’s island and also visit the Sisters' Island Public Gallery. 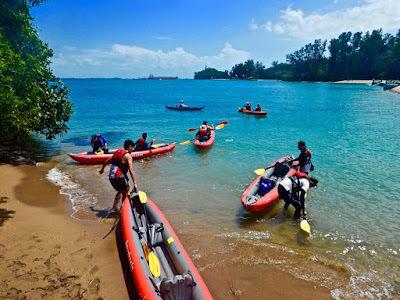 On this easy and relaxing paddle, you will travel to one of Singapore's outer islands carbon-free, using your own power. Swim in its clear waters, get close to Pulau Tekukor, see our city's skyline across the sea.